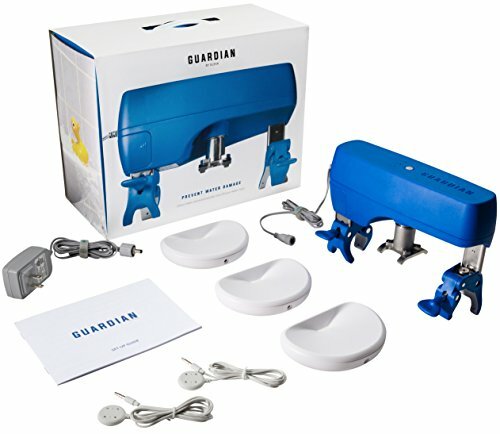 Guardian Leak Prevention System wants to protect your home from burst pipes and flooding, complete with remote access via Android and iOS. This gadget clips onto your water line and can shut off supply if it detects a leak. Your next winter trip to the Caribbean need not include questions over whether you’ll find a flooded basement when you get back. Chicago-based Elexa Consumer Products just announced the Guardian Leak Prevention System, offering a bit more peace of mind to home owners. Guardian is a smart home monitor with remote access that detects and alerts you to leaks from pipe drips or flooding. This is the second leak detection system from Elexa. The company already makes the Dome Home Automation Water Shut-Off Valve and the Dome Leak Sensors. The new Guardian Leak Prevention System uses two components: a valve controller for the pipe, and multiple water-resistant sensors placed around the house to detect flooding and drips. The basic starter kit includes the valve controller and three sensors for $400. Guardian is available now at getguardian.com and Amazon. It will also roll out to select national retailers before April. We haven’t had a chance to test Guardian yet, but it looks like a relatively easy system to install. There’s no need for a plumber or any advanced knowledge of your home’s pipes. The controller is a simple box that clamps on to a pipe and fits over the main water valve in your home. To use Guardian, your valve must be a standard quarter-turn ball valve. If a leak is detected by the sensors, they send a message to the valve controller using a proprietary RF technology based on the Lora Alliance’s low power wide area network specification. For those who want to better integrate the leak protection system into their smart home, there’s also an optional Guardian bridge for $69 that enables RF to Z-Wave connectivity. A Guardian Leak Prevention System water detector. Despite the potential security concerns, having device-to-device communication between the system components means that it should continue to be of use during a power outage. Elexa says the sensors have a range of up to a thousand feet line of site from the valve controller, or 300 feet with barriers between the detectors and the controller. Once a leak alert is received by the valve controller, it uses a mechanized fitting that sits on the valve handle to move it to the off position. This all happens automatically. From the demo video we saw, it doesn’t take much water to send Guardian into action, so you probably don’t want a leak sensor near a source of common water splashes like a sink or bathroom. The leak detectors have an IP67 rating, meaning they are fully resistant to dust and can continue to operate in water submersion up to one meter. The controller weighs 2.8 pounds and measures 8.25-by-6-by-3.5 inches. The controller also needs to be plugged in, but there is an optional battery backup that Elexa says will work for up to twelve hours after the lights go out. The Guardian System also offers an app for Android and iOS to access the system remotely and monitor its stats, such as whether the water valve is on or off, battery status, and the temperature around your main valve. This all requires Internet access, however, meaning remote access won’t be accessible during a power outage at your home. Saving your home from water damage isn’t as exciting as a light that turns blue at 8PM every night, or a speaker that can tell you the weather forecast. Nevertheless, leak prevention is an ideal addition to smart homes especially for anyone who lives in a place that goes sub-zero in the winter.